Quick and easy to install our permeable paving can be laid at approximately 100 m² per hour when delivered in 1m² sections on a pallet of 50m². Also available is a retail pack sold in a 2m² that will require simple ‘locking’ into place. There are nine EASYGrids per m². The EASYGrids for Shed Base form a stable surface for sheds/greenhouses and cabins. 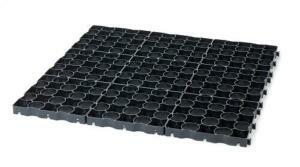 The plastic paving can be filled with gravel or grass for a decorative finish which is permeable to water. Strong and durable, the EASYGrid permeable paving system has been tested with a compression strength of up to 300 tonnes. Shed base, car space, roof garden and more!